In today’s economic climate, most leaders recognize that effective inventory management will result in significant cost savings and is a barometer of corporate health. A key component is ensuring that on-hand inventory is kept accurate, along with processes to determine the root cause of those variances and clear plans to address it. Unfortunately, few companies have visibility into their inventory and even fewer know how to identify and handle any issues. Read on to discover ten of the top practices to improve inventory accuracy. Transactional Discipline: A lack of transactional discipline is the biggest issue affecting inventory accuracy. It is highly recommended that a policy is implemented to ensure that all inventory that is moved, stored, consumed, shipped, loaned or returned is recorded in the inventory system ASAP. It is important, as well, to clearly define the time period in which these transactions need to be recorded in the company inventory system; e.g., all items that are consumed will be recorded in the company inventory system upon issuance or within the same working shift (tour). Label Items and Locations Clearly: If you’re going to take the time (or hire a 3rd party) to count your inventory, don’t make the job more difficult than it has to be. By properly and clearly labeling every inventory storage locations and items, you will ensure that nothing is forgotten or double counted. This is even more important when your facility is on non-productive time and is unable to locate required spare parts. Also, ensure that any labels that you decide to utilize are consistent, system printed, properly adhesive, and easy to read and easy to change should the need arise. Verification of Counts: This may seem like an obvious step, but let’s not make any assumptions. If you find out that your inventory management is not functioning effectively at your facility or rig during or after a downtime incident. it’s too late. One effective method to ensure this does not happen is to require managers who are not associated with the materials to spot check the counts on a regular basis.This will help to improve inventory accuracy dramatically. During normal operations, we recommend re-counting ten items per month that were counted in the preceding month. If there are any variances, another sample should be ran and counted. Multiple variances of the re-count should trigger a full re-count of the previous month’s inventory count. During a physical inventory count, especially if you hire a 3rd party firm, we recommend that your on-site managers verify all variances on a daily basis. This will ensure that agreed expectations are met and that there are no surprises at the end of the stock take. Determine What is Considered Inventory: One issue that we consistently observe at many companies which causes confusion and/or variances in inventory, is proper classification. All personnel who are involved in inventory management should understand what is classified as inventory. Proper inventory classification should be documented in your company’s policies & procedures to improve inventory accuracy. Use Updated Technology to Improve Inventory Accuracy: Like many other areas of oil & gas operations, the inventory side of the business can become increasingly efficient with the rise of new technology if implemented properly. Rugged handheld devices save time and can be programmed to stream data directly even in remote locations. 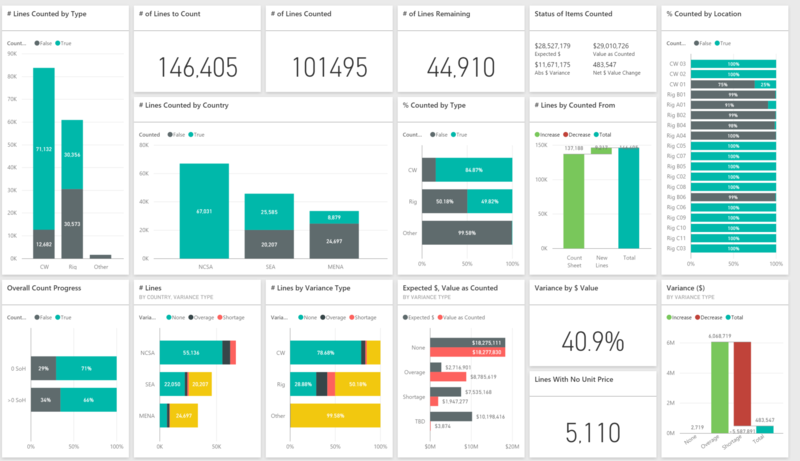 Programs like RigServ’s “Power BI” provide real-time access to dynamic, actionable reports. It doesn’t get much better than that! Be sure to take advantage of the new technology that is available so you can optimize the time and energy you invest in inventory. It is important to ensure that you are measuring what matters when implementing a new solution that is intended to increase efficiency and accuracy. One example we experienced recently was a customer who had recently implemented a new barcoding solution and they boasted that they had achieved 100% utilization of the new devices. This surprised our team, as 100% utilization of any solution would be amazing; however, under further review, they only measured the frequency at which the devices were synced to the system – not whether they had been used to input data. The true transactional utilization was in the single digits (%). Research Discrepancies: It’s not enough to simply count an item on a shelf. You must be able to account then for any variances in the quantity available versus the quantity counted. Most companies in the oil and gas industry miss this crucial step and just stop at counting and recording the results. The exercise of cycle or physical counting is only carried out for three reasons: 1) when it is required by local regulations, 2) to correct on-hand quantities before they affect operation, 3) to determine the root cause of the inventory variances. Train and Educate Your Staff: First things first. Your employees need to understand just how fundamental inventory control truly is to your bottom line. The more effective they can be at helping your company keep tabs on inventory, the more money you will save – which is better for them and for the company! More specifically, ensure that all personnel understands how important inventory control is to a successful and efficient operation and client relations. Training like the inventory management courses that RigServ provides are a cost effective way to make a real difference in your inventory management. Complete Regular Cycle Counts: Outside of your regular physical inventories, you should implement a schedule for cycle counting all of the items in your inventory every calendar year. Items that have more stock turns should be counted more frequently for an organization that sells a product, but to the end user, it is items that are critical to operations that should be counted more frequently. On an offshore or onshore drilling rig, the OMA/OMC/Materialsman/Storekeeper should count a specified number of items per week to complete the yearly requirement of a complete count, and the installation manager should be held accountable for timely execution of those counts to improve inventory accuracy. Reporting: You should know the reports related to inventory that truly impact your business. We often work with customers who complain that they have too many or not enough reports. They typically have had no training in how to utilize the available data to detect impending issues. It is recommended that you invest in intelligent systems and reporting that alerts you to potential issues before they become critical (see tip #5). Hire Professional Help: If you’ve struggled to maintain proper inventory control or improve inventory accuracy in the past, chances are that you simply don’t have the personnel or the right tools to manage this process internally. If that’s the case, you are certainly not alone. In fact, most businesses in the oil & gas industry do not employ enough staff to effectively conduct regular physical inventory internally, especially in the current downturn. For instance, think about the typical materials person on a jack-up without 24-hour coverage: do they have enough time to perform an effective stock take? This is why RigServ exists. We take all the stress out of inventory so you can focus on core competencies!